Most of the search engine optimization advice on the Internet is wrong! - Most published SEO advice is either outdated or just dead-wrong. - Google's constant updates have made many popular SEO optimization strategies useless. 1. March, 2017 - Google's mysterious FRED update is released, with a selection of overly commercialized websites being penalized and seeing significant drop offs in traffic. 2. September, 2016 - Google announces Penguin 4.0, a big update to their link-spam algorithm, which is now a real-time addition to their core search algorithm. 3. September, 2016 - Webmasters report a groundbreaking update to Google's local search results known as the Possum update, creating new challenges for local businesses. SEO 2017 is now updated covering the latest changes to Google's algorithm, and walks you through all major updates and how to use them to your advantage. This book also reveals industry secrets about staying ahead of Google's algorithm, and potential Google changes coming up in 2017. 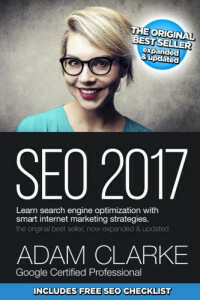 With this best-selling SEO book you can learn SEO from a fundamental level, achieve top rankings, and generate a wave of new customers to your site.